I have always been fascinated by how the bicycle has muscled its way into various languages. There are numerous bicycle references in Danish that are used by reflex, without any direct reference to a bicycle anecdote. I started wondering if this is the case in other languages and have scribbled notes down based on conversations with colleagues and friends. 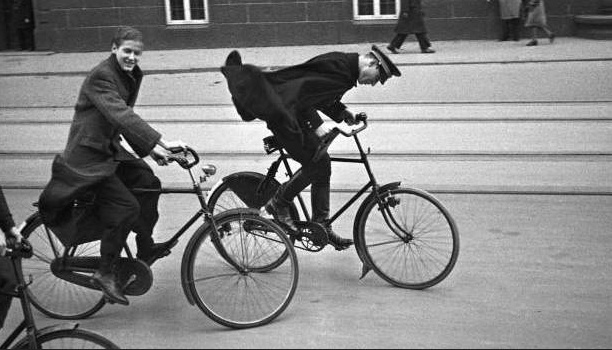 According to Danish historian Finn Wodschow, there are more references to the bicycle in Danish literature, music and film than in any other country. Not surprisingly, there are a few bicycle-related expressions that have embedded themselves even deeper in the linguistic culture. If you know of any others, in other languages, feel free to add them in the comments. "The chain fell off" is used when something goes wrong. "Sorry I'm late, but the chain fell off for me today". You can also claim that the chain fell off for someone else, if they are having a bad day, or screwed up. "Cycling around in it" is used to describe someone who is confused or talking about something without really getting to the point. "That politician is really cycling around in it." "Tailwind & headwind" are pretty self-explanatory. Although while in English the word tailwind originates in aviation, in Danish the translation is more generic. "With wind" and "Against wind". Denmark is a windy place. It's also a sailing nation. Wind factors in to many aspects of life. Because of a long, proud bicycle history, however, these two words are used often in the language. If things are going very well for you in your life... "Sounds like you really have a 'with wind' at the moment! Great!" Or if things aren't going so good, "Yeah, my company is in a bit of a headwind this year." "Sun or wind". When your Nordic citizens, by and large, have spent great amounts of time transporting themselves on bicycles for over a century, things get boiled down to the basics. Sun is good. Wind is bad. Indeed, since 1934, two statues have looked out over City Hall Square. One is a woman on a bicycle who rotates out when it is fair weather and one is a woman with an umbrella, who rotates out when the forecast is for rain. THAT'S how important sun and wind are here. How is your new relationship going? "Not sure. It's sun and wind." To "give backwheel" is a very good thing, unless you're the one who was given it. You can also "show" your backwheel to someone if you want to get ahead of them in whatever sense. This one orginates in cycle sport, but is used in all aspects of Danish life. "Give cancer the backwheel!" is actually a campaign to raise money for children with cancer. A TV show can give another competing show backwheel if they beat them in the ratings. And so on. "Lying on the backwheel" - essentially 'drafting' in English - is not something you want to do but it can also be a good thing. A political party can lie on the backwheel of a competing party, meaning they are being beaten in the polls. You can, however, also say "Now I'm lying on his backwheel", meaning you have risen up the ranks and are breathing down a competitor's neck, ready to overtake and put yourself in the lead. To move into a "higher gear" is generally considered to indicate that you are speeding up, gaining momentum, going to the next level. To "ride on a free wheel" in English (see farther down) is regarded as a good thing, suggesting freedom. If somebody gets a "free ride", however, it is not generally very good at all. Which is the meaning in Danish. To "give it full pedal" means to speed up, accelerate, go hard. We have to give it full pedal if we're going to make the deadline. "Keep your chain tight". Meaning "hang in there" when you're doing something, be it working towards a deadline, going through a rough patch in your life, and so on. As a country with a proud cycling history, the bicycle has made several linguistic contributions to French. Essentially "sucking the wheel", this is French for sitting tight on the backwheel of the cyclist in front of you. Same as the Danish meaning and used in other areas of life. Having "the head on the handlebars" is not considered a good thing. If your forehead is on the handlebars, you're not watching where you're going. You are distant and inattentive. In French it is used to describe someone with odd, inconsistent behaviour or behaviour outside the norm. If you "lose the pedals", things are not good. You are losing control or going crazy. Dates from the age before the free wheel when the pedals just went round and round in a world of their own. Can't keep up? You've lost it. "Changing the gears" means, like in Danish, to get moving, go to the next level. Directly translated as "in free wheel" this expression exists in French, like it does in Danish and English. In French it means "without restraint" or "easily, without additional effort". Clearly different than the Danish, but positive like in English. Mostly shortened to plain old "Bécyk", this is a slang for the bicycle unique to Quebec French. It is a mutation of the English word bicycle and has generally had a derogatory connotation. Just short of ridicule of a transport form for poor, working class people. I have heard it used, however, more and more often in Quebecois as a generic slang for bicycle. Translated simply as "With no helmet", this phrase went in the opposite direction, from ice hockey to general use, including urban cycling, and is another phrase unique to Quebec French. Helmets started to appear in North American ice hockey in the 1970s. They were made mandatory in 1979 but players who had signed a contract before 1 June, 1979 were not obliged to do so. Many top players from Quebec were known for their flowing hair and the expression became associated with a kind of freestyle attitude. Someone with flair and style. The current mayor of Le Plateau, Luc Ferrandez cycles without a helmet and pas d'casque has been used to describe him in more ways than one. It may have other applications, but it is also has sexual connotations. "You have to learn it on an old bike" can be used to describe a young man dating an older woman. "Bike rack". Used to describe the gap in a child's teeth when they lose the front ones. A hole big enough to park a bike in. This translates as "on that bike". The meaning is akin to "oh, THAT'S what you mean", when you just realised it. "What's hanging from my bike now?" is the translation and it means something like "What weird thing is happening now?" or, quite possibly, just WTF!? "Riding in the wheels" and it refers to obstructive behaviour. While the translation is "just go cycling", it really means "piss off!" "To bike wine" sounds weird when translated, but it describes a bottle of wine that is good value (meaning cheap... they are Dutch after all) and worth making a detour to buy it. In English this is "If you believe that, you'll believe anything. In Dutch it is "if you believe that, you get a bicycle." When somebody tries to invent something that isn't needed because it's already well-established and works perfectly, you get to chuck out this phrase in Russian. In my notes I have this written down, but I can't remember exactly where it is from. It might be Russian or another Slavic language. In English something can be called the best thing since sliced bread. In this language something really fantastic is called the best thing since the bicycle. Because let's face it, the bicycle was a pretty great invention. Any help in tracking this expression is welcome. These two well-known expressions in English are worth mentioning. If something is effortless or easy, it's as easy as riding a bicycle. If something - generally a skill - is easy to remember, it's just like riding a bicycle. This expression has its root in the early days of the bicycle. In contrast to Danish (see farther up the list), it is generally a good thing to be a freewheeler. Just as the invention of the free wheel was a pretty good thing, too, so you didn't have to keep pedalling and could just relax. Again, from back in the day when privileged white boys who could afford the early models of bicycles like the Penny Farthing took to racing them against each other. If you went over the handlebars at speed on a Penny Farthing, breaking your neck was a realistic possibility. Coasting downhill on a bicycle was/is a pleasure. This word still lingers in English. Not totally embedded in English, but still instantly understandable. "I think it's time to take your training wheels off" - which could be good or a bit condescending, depending on the context. More widespread in the UK, if you say 'on yer bike' to someone, you are basically saying, "get lost". On a less positive note, a promiscuous woman can be called the town bicycle/ the village bicycle because, it is claimed, everyone has had a ride. How did I forget this one? Totally rooted in bicycle culture. Meaning retracting your argument or changing your opinion in the face of opposition. Yeah. No guesses as to where THAT description of certain style of hairy upper lip came from. Here are some other, general descriptions using the bicycle from the annals of Danish culture that I've discovered through the years. "One sits on it either straight-backed, as though you're at a festive dinner party, or hunched foward, as though you just failed an exam. All according to the situation, your inclination or your inborn characteristics." "And like a large home Copenhagen begins the day's work. Already down on the streets is one at home, with loose hair, long sitting rooms through which one travels socialbly on a bike. In offices, in workshops, in boutiques you are at home, in your own home, one large family that has divided the city among itself and runs it in an orderly fashion, like a large house. So that everyone has a role and everyone gets what they need. Copenhagen is like a large, simple house." "In the stream of cycles over Knippels Bridge we see Gudrun again, pedaling steadily. As though her and the machine are one. She is Copenhagen and Copenhagen is her." "If one (Ed. cyclist) is bumped by a car, the whole school is bumped. It's a nerve one has in the elbow, a flock function, which Copenhageners have learned so well that it is second nature".